This is the first of two versions of ‘The Ugly Duckling’ made by Disney. Unlike the latter, more familiar version, this ugly duckling is a real duck, accidentally born to a chicken. He’s rejected until he saves his chick brothers and sisters from drowning in a long, fast and exciting action scene, involving both a tornado and a waterfall. 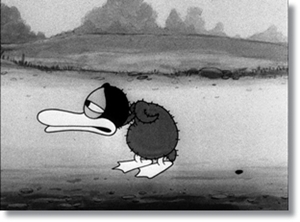 Although looking crude and primitive when compared to the 1939 short, this first version of The Ugly Duckling is a milestone in Disney’s storytelling: while the earlier Silly Symphonies contain a lot of repetitive animation and dance routines, The Ugly Duckling is the first Silly Symphony to tell a coherent story from the beginning to the end. Even the Mickey Mouse films of that time are not that consistent. There still is some rhythmic movement, especially at the beginning, but most of the animation is there to tell the story. The duckling (who repeatedly looks to the audience for sympathy – not unlike Oliver Hardy) is a real character who transforms from an outcast to a hero, and gains its well-earned sympathy at last. Its best scenes are when it feels rejected, not only by his ‘family’, but also by a cow, a dog and a frog. There’s some genuine feeling of loneliness and unhappiness in these scenes, unparalleled in any other animated film of the time. This short, which is neither about gags nor about moving to music, would be the first testimony of Disney’s ambitions in storytelling.